The key to mastering IRS Schedule E for landlords – "Supplemental Income and Loss" – is to organize your income and expenses using a spreadsheet or personal finance software program. Landlords who keep detailed summaries of their rental property expenses are the ones who benefit the most at tax time. IRS rules regarding rental income are pretty generous so you'll want to take advantage of them. If you track these expenses using personal finance software or a computer spreadsheet, your monthly and year-end reports will be right at your fingertips and you can easily print them. Here's generous IRS rule #1: If one of your rental properties has a net loss for the year, that loss can be netted against the losses and profits of all your other rental properties. Now here's the maybe-not-so-good news: If the grand total for all your properties is negative – a net loss – that loss might be fully, partially or not deductible at all against the rest of your income for the year due to passive activity loss limitations. Renting out real estate property is generally considered a passive activity, even if you devote a substantial amount of time to selecting the right tenants, repairing the rental unit and inspecting the property for routine maintenance. Losses from passive activities are limited to offsetting passive profits. For MAGI of $100,000 or less ($50,000 or less if married filing separately), rental losses can be deducted in full, up to the $25,000 ($12,500) limit. For MAGI between $100,000 and $150,000 (between $50,000 and $75,000 if married filing separately), rental losses can be deducted up to a limit of 50% of the difference between $150,000 ($75,000 if married filing separately) and MAGI. For MAGI over $150,000 ($75,000 if married filing separately), none of the rental losses can be deducted against other income. This brings us to generous IRS rule #2: Rental losses that are limited by the passive activity loss limitations can be carried forward to the subsequent tax year when they can offset rental profits. 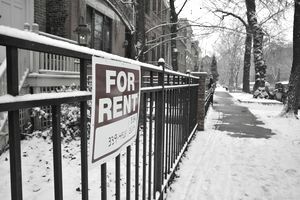 The passive activity loss limitations are applied each year, but rental losses continue to carry forward year after year until the losses are either used up by offsetting rental profits or by being deducted against other income. Form 8582 is used to calculate passive activity loss limitations and to keep track of rental losses that accumulate each year for each property. Landlords occasionally make a small profit when the rental income is sufficient to pay the mortgage as well as property taxes, insurance, and repairs. However, landlords get to depreciate the purchase price of the rental property, and this can often turn a small economic profit into a small tax loss – expenses exceed income after depreciation is taken into consideration. Every so often, however, landlords face major expenses, such as replacing a roof or gutting an apartment after a long-term tenant vacates. In these circumstances, it's possible that the landlord has a loss greater than $25,000, but the passive activity loss rules limit the loss to exactly $25,000. The remainder will be carried over to next year when the landlord will hopefully have more of a profit and will be able to absorb the excess tax losses. Rental losses for a particular property are allowed in full in the year in which a property is sold in a complete disposition to an unrelated buyer. Selling a house, apartment building or other rental property is not the same as selling your primary residence. Just as when you're calculating capital gains, the formula for calculating the gain or loss of rental property involves subtracting your cost basis from your selling price. If the resulting number is positive, you made a profit when you sold your rental property. If the resulting number is negative, you incurred a loss. Gains on rental property can be taxed partly as depreciation recapture at a maximum 25-percent tax rate and partly as capital gains. Rental property sales are reported on Form 4797, and any capital gain calculations are reported on Schedule D.
Many landlords consider forming corporations, limited liability companies or partnerships to own their rental properties. A corporation might be disadvantageous because corporations don't have a preferred tax rate on long-term capital gains. A limited liability company would be able to pass long-term gains through to its members so gains would still be eligible for the preferred 15-percent rate on long-term gains. Landlords should discuss this and other legal aspects of forming a company for rental properties with an attorney to understand the legal and financial implications of such a strategy.